Dr. Comfort diabetic no show socks are designed to keep your feet healthy. Their smooth-seam construction reduces the risk of unwanted friction that can lead to calluses. Anti-microbial odor control and nano bamboo charcoal fibers help keep your feet dry, which prevents infection. And because they’re non-binding, they don’t inhibit your circulation. Dr. 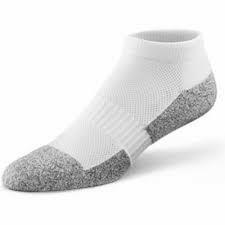 Comfort no show diabetic socks are available in white, black, and pink.